The Shiny Vampire Club: First look at Caius! I saw some other pics of this boy with major eye make up on and nail polish... is that suppose to be cool?! Wha - wha - WHAT? He doesn't even look 20, let alone centuries old. That is so not Caius. It's just not. Alec, maybe . . . (and that's a very strong maybe). I blame the new director for this farce. Wow! Yeah really pictured the head Volturi a bit older! I guess we'll see...so far I have been impressed with the changes C.W. has made...Hopefully this one works out! hmmm... what's not evil about this guy's pic? his broach? his hoop earring? his shoulder pads? haha! 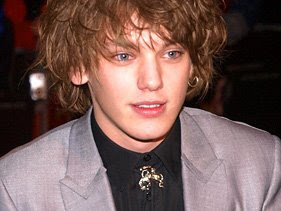 he is not what i pictured of caius either. however, on the first link that jes posted there is a link to a pic where they vampired him up and he looks a little more vamp. Yeah, hopefully they can do something with special effects. I pictured all of The Volturi as older. Maybe that's not true though -- maybe it was just their papery skin that made me think that? I'll have to go peek in NM again. wow, I suddenly feel really old. he doesn't look that old... but WOW. HE LOOKS LIKE RIAN Z~Z!!!!!!! only RLLY HOTTIE!! !